The Newest Rant: I Had a Dream About a Comic I Wish Existed--"More Wednesday Comics." I Had a Dream About a Comic I Wish Existed--"More Wednesday Comics." Before I tell you about my dream, a history lesson. 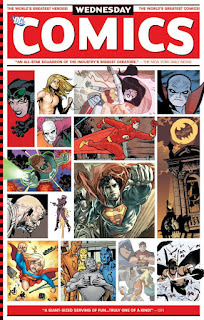 Some years ago DC had an amazing Summer event, one of my favorite events they ever did. For twelve weeks they released a big piece of newsprint that could be unfolded to reveal massive comics featuring an assortment of heroes. There were different tales all done by a cool team of writers and artists (and some writer-artists). 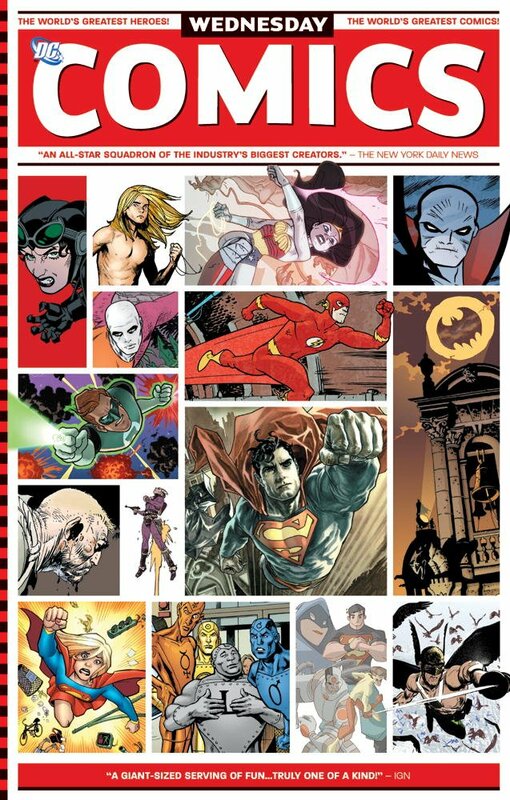 Out-of-continuity yarns about Batman, Superman, Wonder Woman, Meatmorpho, Aquaman, Hawkman, and so forth were done by a who's-who of creators including such big names like Neil Gaimain, Kyle Baker, Amanda Conner, Walter Simonson, Joe Kubert, Dave Gibbons, and too many more to name, all who gave us lots of comic-book goodness. It was collected in a massive hardcover that matched the size of the newspaper when unfolded. I loved it, and DC hasn't done anything like it since 2009. Except in my dream. Now then, a couple days ago I had a dream, you may know the kind. I refer to if you ever have a dream where you don't recall the majority of what occurred but a small detail stands-out in your mind? I had such a dream. I don't recall the general plot/focus, but at one point within this dream I'm in a Barnes and Noble and spot a massive hardcover collecting something called, "More Wednesday Comics." Within the dream I glanced at the front and back before my dream continued with whatever surreal story it was telling--I honestly can't recall the rest--I remember that book with a shocking clarity however. "More Wednesday Comics," on the back describes how it is the hardcover collecting the, "Sequel to the smash-hit series before it," with a focus on creators returning to characters they did beloved runs on for fresh takes along with new talent. Interestingly enough, Quitely has drawn a version of The Question. It was for the, "Pax Romana," one-shot as a part of, "The Multiversity." The book discuses how it has stories such as a new strip on The Question written by Denny O'Neil (who did my favorite run on the character) with art by Frank Quietly. Also, none other than Alan Moore writing a horror-heavy story about Swamp Thing illustrated by Bernie Wrightson. Grant Morrison stops by to do a darker take on, "Superman," basically completely counter to, "All-Star Superman," with art by Eduardo Risso (who in real-life illustrated the Batman-story in the original, "Wednesday Comics," publication). Frank Miller writes and draws a story that involves weird time-travel resulting in his Batman from, "Year One," meeting-up with the one from, "Dark Knight Returns," and basically being disgusted and pledging he'll never end-up like his older-self, whilst the older-Batman mocks the younger one's naivete. Jack Kirby and Tom King collaborating for a, "Fourth World," epic co-written together and illustrated by Kirby in the vein of the recent, "Mister Miracle," sounded cool, and for some reason Jim Balent writes and draws, "Wonder Woman," which within the dream confused me as he is of course known for his work on, "Catwoman," and never wrote or illustrated Wonder Woman as far as I know, but trying to make sense of a dream is a fool's errand. It was all very strange yet exciting. A lot of these stories couldn't happen or won't happen (Alan Moore isn't exactly on speaking-terms with DC, Jack Kirby died before Tom King even started making comics, etc.) but within my dream this big hardcover book existed and was glorious. I told my wife how I had a dream about a comic that didn't exist and she asked if maybe it really did, at least in some form. She wondered if I didn't utterly imagine it, which I had to tell her I tragically did. This made me wonder what it would be like if something at least slightly like my dream could happen--I mean, if DC ever made a sequel to, "Wednesday Comics," I would for sure want to buy it as it came out and when it was collected. After all, even if my version I dreamed about is impossible to create (in this reality at least) I would enjoy any kind of, "More Wednesday Comics," DC could potentially give us. For now though, all I can do is literally dream.